Am I ready for prime time? Nope! But that has never stopped me before! Aloha faithful readers. I am excited to announce that I have become a little techier. Finally, I have created a podcast! This first one (hours that turned into days of learning curves) is admittedly a bit rough around the edges, but there are always lessons to learn, right? This is unlikely to become a “top ten on Itunes” podcast (although…why not? ), but I will be very happy if I can simply reach people who might not want to take time out to read 1500 words but will enjoy 15 minutes (or less) of me chatting. I hope to bring this to you as you are out on a walk, driving around, or better yet…while creating in your studios. ADDENDUM! The podcast is officially a “thing” and you can hear each weekly episode and see the videos and extra downloads anytime right here on this site! If you go to iTunes, PLEASE help me with a review and a big fat five start rating, too! Please share this new podcast and spread the news that there is value here. 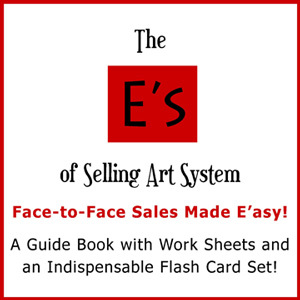 If you are new to this site, take a peek at the dozens of posts on the “E’s of Selling Art” Blog. 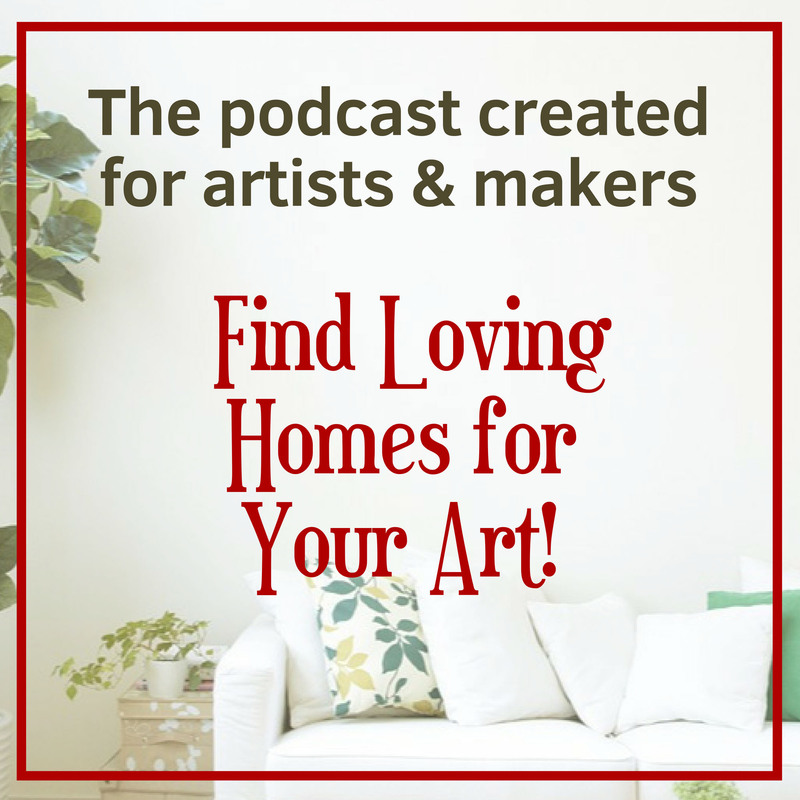 It will be a big part of what I will be drawing on in the future for my “Finding Loving Homes For Your Art” Podcast series. And while you are at it, don’t forget to comment below. I know there are a couple of glitches, but those won’t be repeated in the future. Whatever you are feeling, whatever you can share about the “raw” experience you have during the podcast is very important for me to learn from. Okay… That’s so nice to know! Thanks, Olivia! Yes… lol… the distractions are now on a checklist of pre-show “to-dos”. I love that you sold dirt. Love that entire concept and hope you will put that in a blog post someday! Thanks for commenting here, Nancy. I am very grateful. Some people learn best through listening… so may I encourage you to “find a way to keep going!” After all, that’s what life is about. And that is what eventually did happen! Go listen to more at Patreon.com! As always your words are golden. Even though I have read your book including the 7 year old’s story, used the flashcards,and read your blog regularly, I still had a take away from hearing your story. Your discussion of valuing my art was encouraging, especially when I am in that “waiting to hear” period after applying to art shows. I also have a question regarding discounting. As I design new products or increase my own skill, do I offer my “legacy pieces” at a reduced price or just write them off, salvage anything usable and trash the rest? This won’t be the only podcast devoted to valuing your art (and yourself). Good luck with the shows and be sure to bring your cards with you if not the whole guidebook. Keep me posted! As for “legacy” works… Call them that and own your journey. You might even want to get in touch with the people who bought from you during that “early phase” and let them know that those pieces are still available (unless they are years old!) and offer them free shipping if they are interested. When you show them to the public (and on your website) you can rejoice at the “Early” period work. 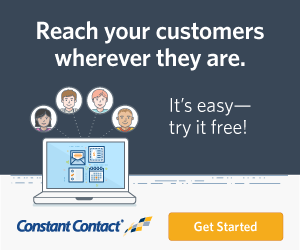 Should you charge as much for them as your new work? YES! Because if you don’t value them, why would a collector? Contact me if you want to chat about strategies… Happy to help find homes for ALL art! I really enjoyed this Mckenna! And I liked being able to listen as I walked around the house and started my day here in California. Thanks for the reminders about finding your market and discounting your work. Aha! Walking around and starting your day with little’ ol’ me? Nice, Linda. Thanks for the imagery. I love this! It’s much more convenient for me to listen while I paint as opposed to reading your message later. You spoke clearly and had a motivating message – find your target audience, don’t lower your prices, get in front of more people, etc. I am so glad this worked for you, Patricia. I hope to be a source of motivation going forward. It’s one of my better “skill sets”. It’s funny!! You sound so completely different live than when I’m reading you. Is it funny like odd? Or did I actually make you laugh? LOL. See how “written” words can get in the way. I try to use my “voice” when I write, but I think if you have never heard my voice, you really have to make up your own identity for the writer, right? Maybe now that you have actually heard my “tone”, this will change my written words. Or maybe I will change? I am nothing, if not curious (about the strangest things). Seeing me might happen someday, but one-step-at-a-time for now. I love multi-tasking, too and I think that is true for many, especially artists. You are officially my friend, Cheral. And thanks for sharing here. That’s what friends do! Now share it with your community, too! Let’s get all kinds of people in on this. Thanks for that feedback, Anna. That rewinding is a great thing, right? I plan on doing the podcast once a month. I will not change to all podcasts for now, maybe never. Time will tell. Some of what I need to share needs deeper digestion that works best in the written format. For now, one down and another one is being birthed next week for publishing next month. Easier whilst I was making a snack in the kitchen. Love that you loved it, Juliet! My voice will never be as cheery as yours, but I will forever try to give out good tips. Best to you as well. And thanks so much for taking time to comment! McKenna, I really enjoyed the podcast! Love your smooth, gentle voice – so important imho for being able to connect. Another must have for me in a podcast is a good microphone, which you nailed. Simply cannot listen to a podcast with a crackly mic. Love the potholder story, I can imagine a cute child walking around knocking on doors. Yes, I remember those days when the world seemed safe enough for that, although I’m not sure it was even then. . . When I was a child around 8 or so, had the classic lemonade stand. My mother didn’t have many cups, so I was washing them out with the water hose until a customer complained it tasted like soap. 🙁 So I shut it down. Fortunately, I didn’t have employees. Thank you for the wonderful podcast! Nice to hear from you, Pamela! Yes, I did invest in a microphone years ago for all my internet things: Website reviews, skype calls, and so forth. I am still learning about the mixing counsel. I think the latter part is “cleaner” sounding than the middle. I still have a lot to “nail” down. Soapy lemonade? Oh no! It’s interesting how many artists did have little businesses in the early years. Thanks again for your comment and I look forward to your feedback in the future, too! I have to admit that I have read Mckenna’s early story before, and was already planning on doing something else while I passively listened to the Podcast. However, I found myself being pulled in by her wonderful story telling. I quickly forgot the other tasks and began to engage with her Podcast completely. I have been working with her for over 2 years now and have read all of her marketing products. Today I enjoyed hearing her advice with all of the enthusiasm and wisdom contained within. Way to go Mckenna and thanks for all that you do! Nice to see this in my comments, Scott. You’re a joy to work with and have become a dear friend, too. Thanks for taking time to put your thoughts here. I am blushing. Listening to your voice gives a connectiveness (? )that just reading your words lacks. Now when I read your writings I hear your voice. It is inviting, encouraging and cheerful. I like that you laid out the points and recapped them. Nice job! Thanks for your thoughts, Debbie. As much as I try to be ME in my writing, I think the “voice” is still imagined until you actually hear my “train of thoughts” in real time! Glad you liked the recap, too. Nice to hear! I think the podcast is a great idea: we get to hear your lovely voice and get more of a sense of how you genuinely want artists to succeed and prosper. It’s also good on the multi-tasking – I like to listen with my lunch or lying down after house work! Anyway, to your main message about value. I think it’s a hard lesson for us artists to learn as we tend to undervalue what we make and price low thinking we’ll be lucky if we can sell it. We find it hard to conceive that that there are people out there who would happily pay more for it. The discounting issue is a tricky one – so much marketing advice says to offer your customers discount on your products – to have flash sales etc. Thanks to your advice, I’ve been able to shift my thinking that art isn’t like everything else. When you see large discounts on art, it looks a bit desperate – a successful artist wouldn’t need to do that. 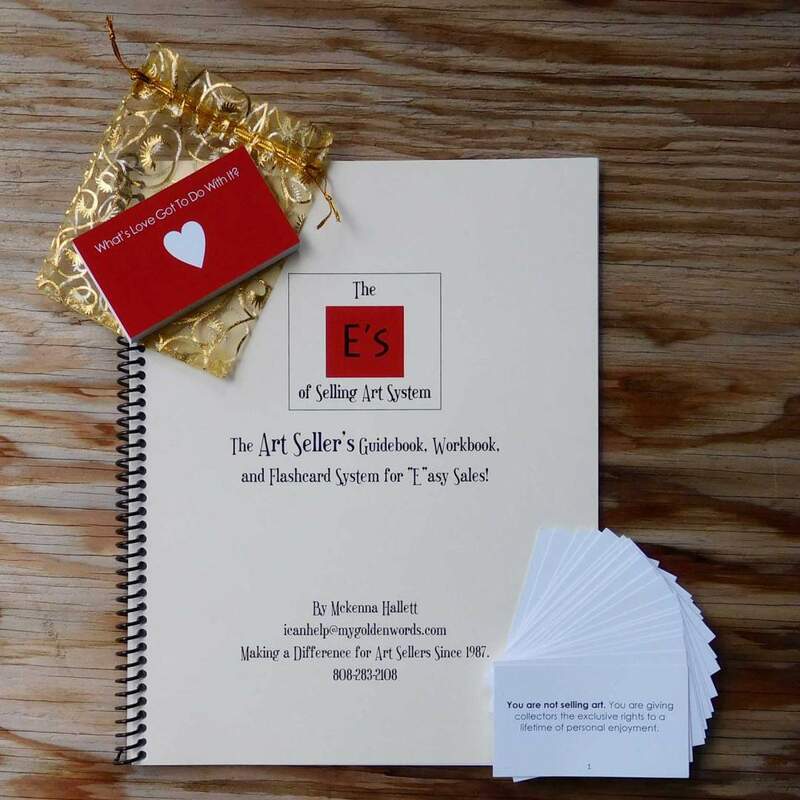 I do wonder what to do with my unsold stock – some things are just less popular than others and I don’t want to have a sale for the reasons you’ve outlined. Thanks for the input. Really good to have you weigh in, Rebecca. I would bet that most of us had that urge to sell something as kids. It’s like a special gene of some kind. Unsold stock is a tough one. But you are so right to imagine a discount looking desperate. And the bigger the discount the more desperate. The discount would be small – not more than 15%. You could offer free shipping, as another incentive. I would treat the entire situation as a one-time event and be honest about your intentions. When the 5 days is up, you remove the shopping cart and recognize you have done everything you can for that collection. Let me know if you want to brainstorm this concept any further. the portion about value of a person’s work was probably the most important to me at this point in time. Twenty-some years ago I was an active artists Card Maker and painter and I would go to shops and market my cards and hand-painted ornaments to the shop owners. Instead. I offered in advance that I would buy them back from the shop at the price they paid me for them.. I didn’t want my cards and hand-painted ornaments marked down because I felt like that it devalued them. All ornaments were signed and numbered and recorded as well as all cards. All were one of a kind. people were coming in asking when was my new fall, Christmas, Hanukkah Etc cards and ornaments would be arriving…. and would ask for them by name I had given each line. I went through a heart-wrenching several years and got out of the business. And all of these years so many things have changed and taken place and everything is so different than it was then. My life today is quiet and simpler and I would like to go back and make my one of a kind handmade cards and hand-painted ornaments Would this strategy still work for handmade and hand-painted? It seems like you had quite a system in place, Conda! And I would imagine that some of those same shops might be interested (if they are still around?) in regrouping with you. There is a more intense price point issue these days and I guess you would need to make sure you are able to profit in the marketplace. Feel free to connect with me. 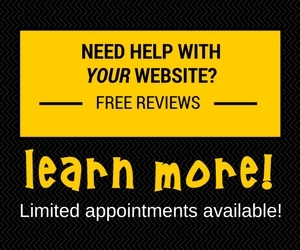 I would be happy to give you a free 30-minute consult. Here’s the appointment link.